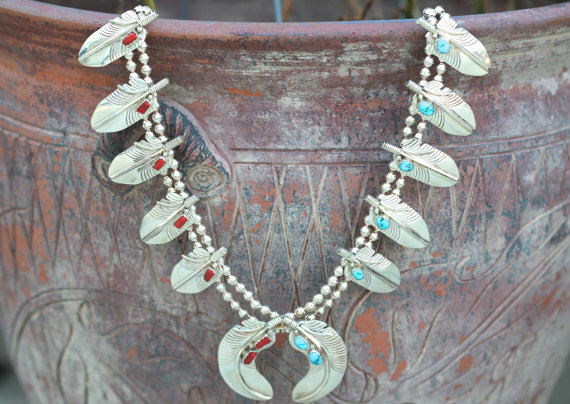 Here are two earlier Navajo Squash Blossom necklaces set with nice turquoise, but they look so different, why? Why is one such a bright white silver and the other rather black? Now you are saying :"I know! The longer dark one is tarnished." Well, that is part of the answer. The tarnished one is sterling silver and it tarnishes because it has copper and probably tin alloy-making it 925 percent silver. The white silver squash blossom is .999 silver. I have owned it for several years and it has never even started to tarnish. 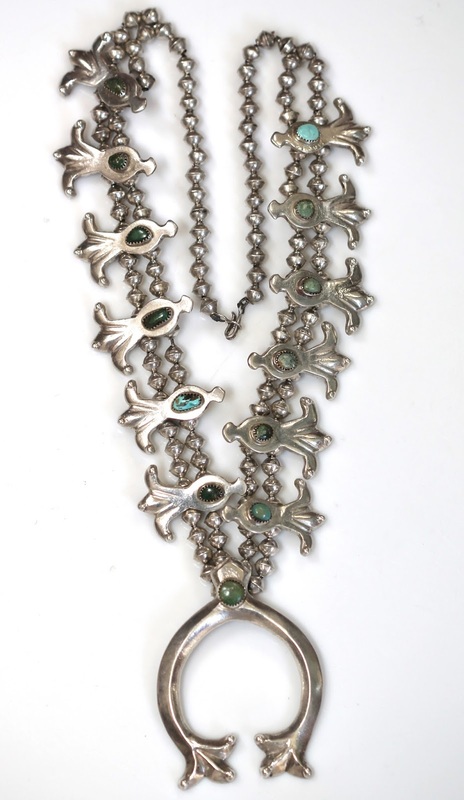 This necklace also looks different because it is a cast piece. The blossoms and Naja were cast in a tufa stone where the shape was carved by hand creating the flat, shiny surface. 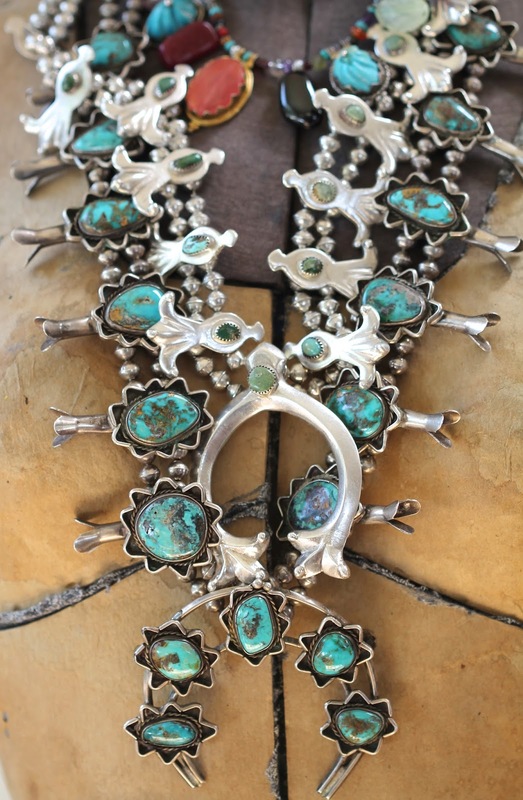 The larger squash blossom was assembled of pulled wire and hand made sterling silver metal peiced formed to create blossoms. 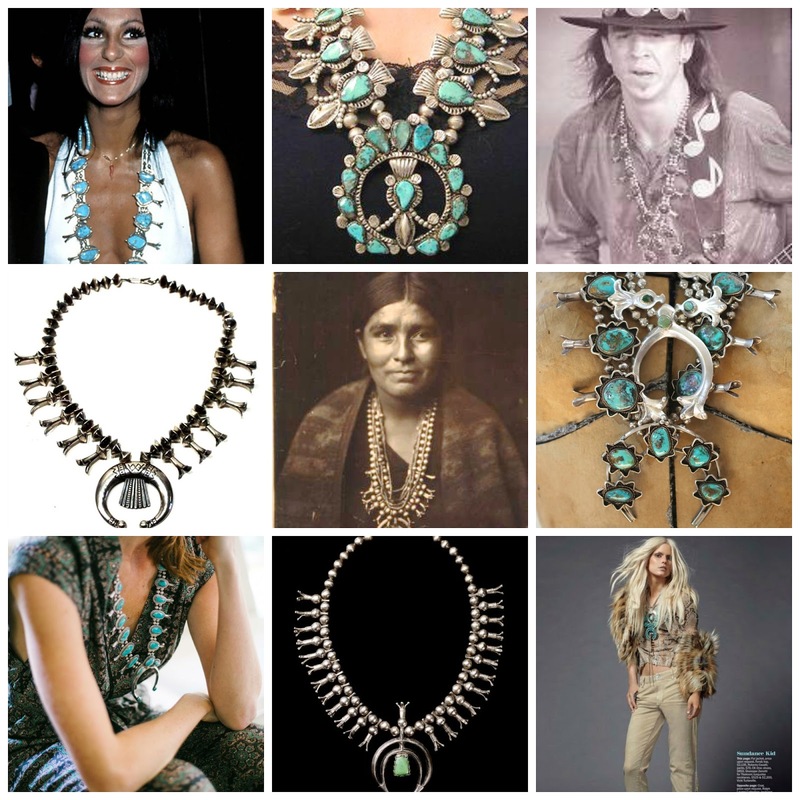 These necklaces are from my private collection. I have been placing them up for sale with two others in my brand New TIAS shop . I will add links to the listings for this items right here on this blog as I create them. Here is the sterling piece. 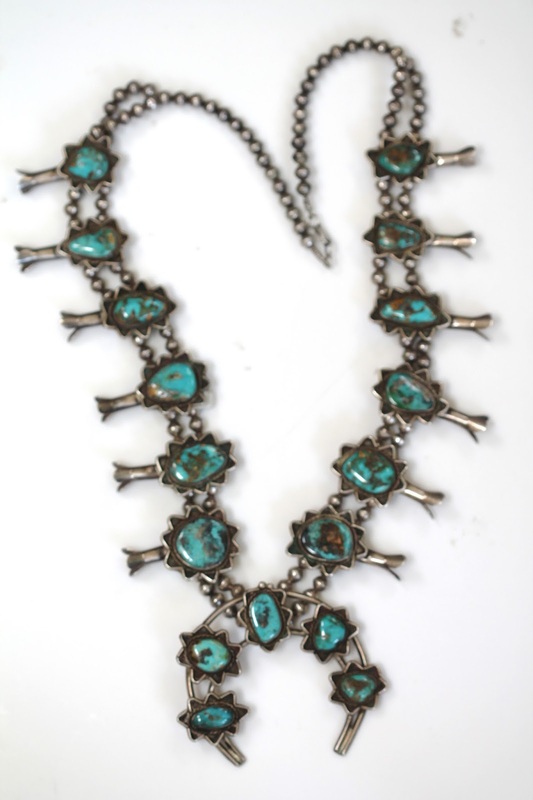 It is set with Bisbee turquoise and it is Pawn. You can find it in my Tias Shop here. Here is the tufa cast necklace. You can find it here. This was just listed. Fully signed. Can be found here. SHHHH! Here's a secret: The tufa cast piece is on sale, huge mark-down in my ONe Kings Lane shop for just a couple of days. See it here: ONE KINGS LANE. And here is a fresh find, just listed and not from my collection. It is a smaller light weight piece that is very comfortable. Can be found here. My decision to sell some of my squash blossom collection is based on my lifestyle change. 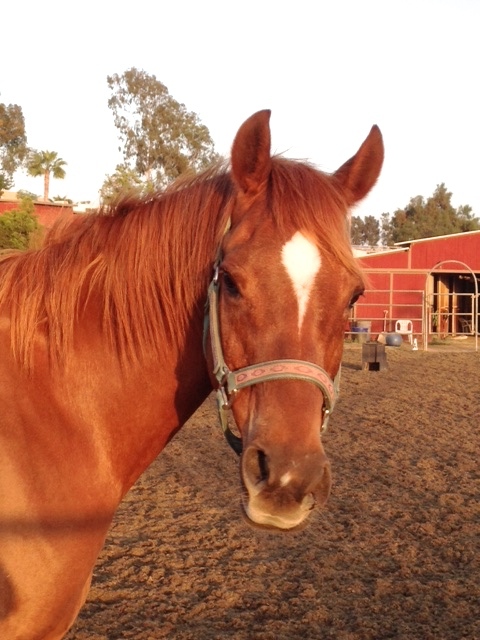 I spend most of my days dressed in riding breeches and boots now that I have adopted my dream horse "Red". I try to get to the ranch for a ride at some point everyday. Wearing a heavy necklace while cantering a horse can pound the heck out of one's chest and I am sure it is not good for the necklace either. Find this necklace set HERE.